The Week in iOS Accessories: Stomp on it! This week's roundup of accessories includes ways to use your iPhone or iPad with either your hands or your feet—or without either, if you choose. Ardesco: It's a stand! It's a hook! It's a recliner! No, it's Ardesco's iHook (iPhone 4 and 4S; $19), a clever stand designed to perform all these duties while adding minimum bulk and weight to your handbag or pocket. It's slated for launch this spring and will be available in black, grey, red, blue, orange, or green. Comfe Designs: This company's new $50 Comfe Hands iPad 2 stand is pitched as being ergonomically correct, making it possible to read and view content on your tablet without straining your wrist or hands. 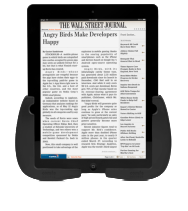 The device amounts to two rounded gripping pads—with grooves for your fingers—that fit over the bottom corners of your tablet; the Comfe Hands can display the iPad hands-free or be handled comfortably. Comfe Hands can be purchased through Amazon.com. DigiTech: Guitar-playing iPad lovers have a growing universe of gear to consider. The latest product is DigiTech's $230 iStomp stompbox. The effects pedal is designed to be used in conjunction with DigiTech's Stomp Shop app, which lets users make in-app purchase of up to 24 stompbox effects for their guitars. Those effects range in price from $1 to $10—users can try each for five minutes without purchasing—though purchasers of iStomp will get their first two effects for free. Mujjo: In this day of touchscreen phones, do they even make regular gloves anymore? All we know is that the market for touchscreen-compatible gloves grows by leaps and bounds every winter. Enter Netherlands-based Mujjo, which is now offering its own iOS-compatible hand-warmers. High-quality, silver-coated nylon fibers are woven into the fabric of the glove, allowing wearers to use their iPhone, iPad, or iPod touch outside, even in the most frigid weather. The European manufacturer charges €25 per pair. Scosche: Stuck out in the wild with a draining phone battery? Scosche has two new battery solutions—the $50 FlipCharge Burst, and its cousin, the $60 FlipCharge Rogue. The former can restore a depleted iPhone battery to up to 30 percent of a full charge; the latter can fully recharge your phone. Each comes with a carabiner clip to attach to your backpack or belt. Studio Proper: Looking for a way to keep your kids quiet in the back seat? The $40 Headrest attaches your iPad to the back of a car seat, letting the tykes watch video, play games, or engage in other distracting activities. The anodized-aluminum mount has a flexible arm so your tablet can swing to a central position between the two front seats, letting all backseat passengers get a view of the action; you can display your iPad in either portrait or landscape orientation. TwelveSouth: We know that iPads are often used in the workplace, side-by-side with a Mac. The $80 HoverBar formalizes that process, letting a user mount their tablet on a flexible arm that itself mounts to the back of your iMac. The iPad can then "float" above or beside your desktop computer screen. TwelveSouth says the design was inspired by Iron Man's Tony Stark; it certainly enables a new level of multitasking.